Tezos is quietly developing its platform unperturbed by the price action surrounding crypto. In my opinion, this should be the hallmark for a legit and dedicated project. I know many of you might be aware of Tezos’s initial mess where there was a class action lawsuit against it and then some internal conflicts after raising a heft ICO of $232 million in 2017. Tezos has overcome all those challenges and is now steadily accelerating towards its product development as its mainnet went live in September 2018. With the mainnet launch, its tokens (Tezzies XTZ) also went live and are tradable now. Many of you might have bought Tezos and have kept it on exchanges, but that’s not a recommended practice. That’s why today we are presenting you an exhaustive list of Tezos wallets to store your Tezzies safely. Ledger Nano S is one the most reliable hardware wallet for more than 700 cryptocurrencies including Tezos. For those of you who don’t know about Ledger Nano S, should pause for a moment because this is undoubtedly the most secure crypto wallet out there. It is a small pen-drive like device which can be accessed through their desktop wallet (Ledger Live). Using Ledger Live, you can install the Tezos app on the device and then connect it to third-party GUI interface such as TezBox to manage their Tezos. Using Ledger Nano S and TezBox you can be sure that your Tezos funds are safe and can also safely delegate your Tezos funds through them. So what are you waiting for? If you are a Tezos holder and want to secure your Tezos in the best possible way!! Look no further than Tezos supported Ledger Nano S wallet. TezBox is one of the pioneers Tezos GUI wallet to be made by Tezos community. TezBox is available now as web wallet and as a desktop wallet for Mac & Windows users. However, Linux and mobile users (Android & iOS) need to wait. Moreover, it is a secured wallet interface for Tezos as all private keys are stored on your device safely. For enhanced security TezBox GUI wallet has also integrated with Ledger Nano S & Trezor, thus becoming the first wallet to do so. 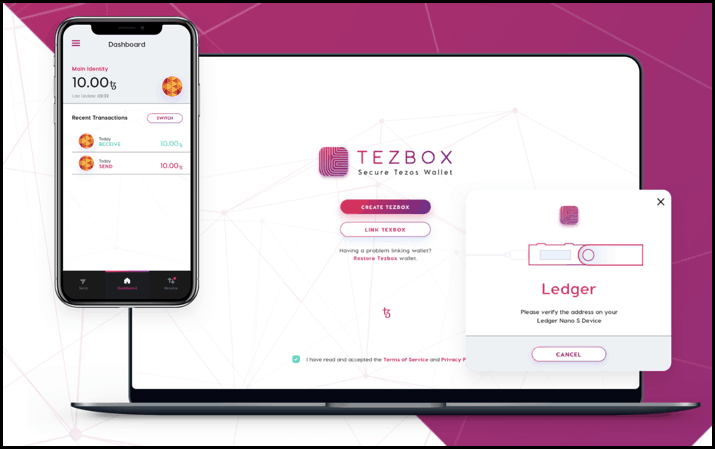 The UI of the wallet is very user-friendly, and developers can also easily integrate their DApps using TezBox. CorTez is another community developed Tezos wallet, but the good news is, it is for Android users. CorTez is developed by a team of developers from Paris, Frace and aims to bring maximum security to Tezos mobile users. Moreover, it is 100% open source and provides you mnemonic of 24 words when you initialize your CorTez wallet for the first time. This mnemonic is to be kept secret as anyone with this mnemonic will be able to spend your Tezos funds. For enhanced security, you are required to set a master password for your CorTez wallet while setting it up for the first time. This password will be used to protect your private keys: to send ꜩ to an address the user needs to enter the master password (or use the fingerprint if the option is checked). Tezos.blue is a non-custodial wallet for Android users to safeguard their Tezos without any hassle. You can create your identity and accounts efficiently using Tezos.blue and also activate, delegate, transfer and receive Tezos (XTZ). On the security front, you need not worry much as they take enough precautions so that your secret remains with you only. Multi-level encryption of your keys on the device and in memory will leave the hackers in despair, so just relax. Furthermore, it is always in sync with the Tezos blockchain to keep you updated in real-time with your account which is even strengthened by their quick notification system. To get started with this wallet you no longer need to do a KYC check or log in using your email ID. Instead, you can download the wallet right away and start using it. Note: Tezos.blue is available in the testing version for iOS users that’s why we won’t recommend it for iOS users now. Are you looking for another Android wallet for Tezos? Well, we have it for you!! 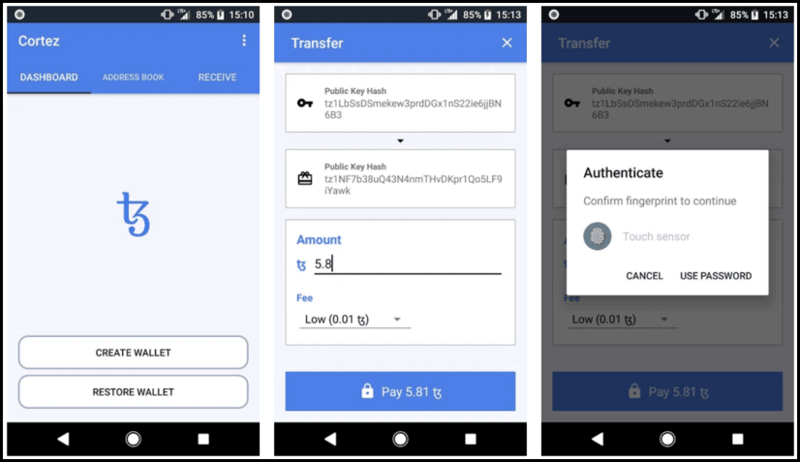 Wetez is an Android wallet for Tezos that allows you to store/send/receive/manage XTZ (Tezos). Apart from that you can do the delegation work also from this wallet by controlling your delegate, add the amount, add bond, and refund. Note: Do not engage with their iOS app as it is still incomplete. Atomic wallet is another secure wallet for storing your Tezos funds. It is a multi-asset non-custodial wallet through which you can send/receive/store Tezos and more than 300 other cryptocurrencies. When using Atomic wallet, you need not worry about your security because private keys are securely encrypted in your device itself. 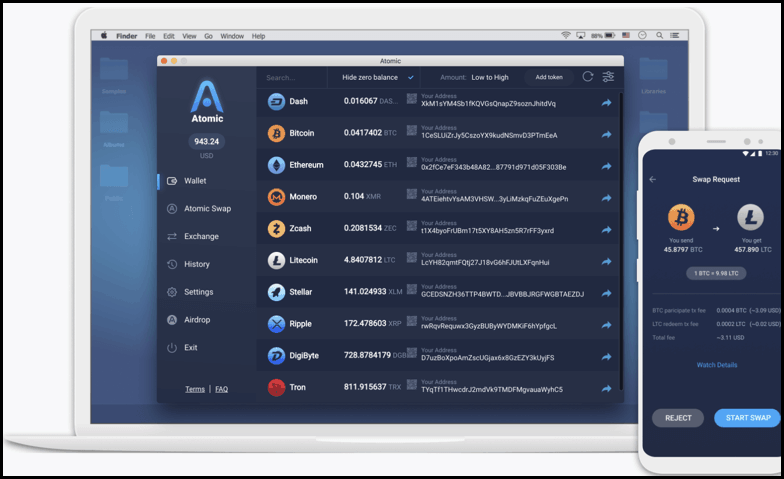 Atomic wallet is available for all the desktop operating systems such as Windows, MacOS, Ubuntu, Debian, and Fedora. But it is still to be launched for mobile apps. With Atomic wallet, you can also exchange your Tezos to other cryptocurrencies using instant exchange services such as Changelly and ShapeShift which are in-built in the desktop app itself. BakeChain a multi-platform wallet for Tezos token storage and its baking. Baking is another name for staking in proof of stake currencies like Tezos. Using the intuitive BakeChain desktop wallet, you can manage and bake Tezos. It is a lightweight desktop wallet which doesn’t require you to download the full blockchain and run a full node. Lastly, your private keys are stored on your desktop only, when you use BakeChain wallet, but for now this wallet is available in beta version for Windows and Mac only. 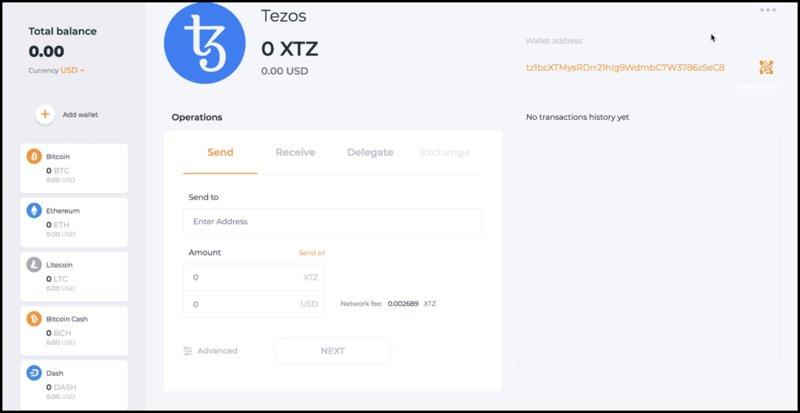 Tezzer is the official Tezos (XTZ) wallet released in July 2018. It is a light desktop wallet for storing and managing your Tezos funds, where you are not required to run a full node or download the whole blockchain. Initially, this user-friendly wallet was being developed solely by Tezos community members, and later it was reviewed by Tezos foundation to reinforce trust in the wallet. It is a windows-only wallet where you remain in control of your funds because you get the seed words to secure your Tezos. Here is its official installation guide to help you set up Tezzer -official Tezos wallet. T3Wallet is an open-sourced Tezos wallet web application. Using this wallet, you can build locally and use it also offline for the best security. It is a non-custodial wallet where you control your seed and hence the private keys of your wallet. The best practice is to write down your mnemonic phrase (seed) on a paper and keep it safe because you will need it to access your wallet. You can also use this wallet with Ledger Nano S because the integration is already done for superior security practices. Magnum is a highly secure and intuitive web wallet for Tezos as well as numerous other cryptocurrencies. It is one of the very few multi-currency web wallet application where you control your funds using a single password and a backup file. Using this wallet you send/receive/store your Tezos effortlessly. And not only this, Magnum give you access to a dedicated window for one-click delegating service where users can choose a masternode and delegate their XZT in one click. Are you looking for a complete solution to store your Tezos across various platforms? Well, we have covered your back. Gaurda multi-currency wallet is one the best wallet for several cryptocurrencies including Tezos. Gaurda wallet support Tezos, across its mobile, web and desktop platforms. Guarda wallet is a simple and intuitive non-custodial wallet where you control your funds always. Also, its web version, as well as chrome extension both, are available. So Tezos holders can choose whatever they may like. But I would suggest you go for desktop client version for Mac, Windows, & Linux because web wallets can often get you pished. 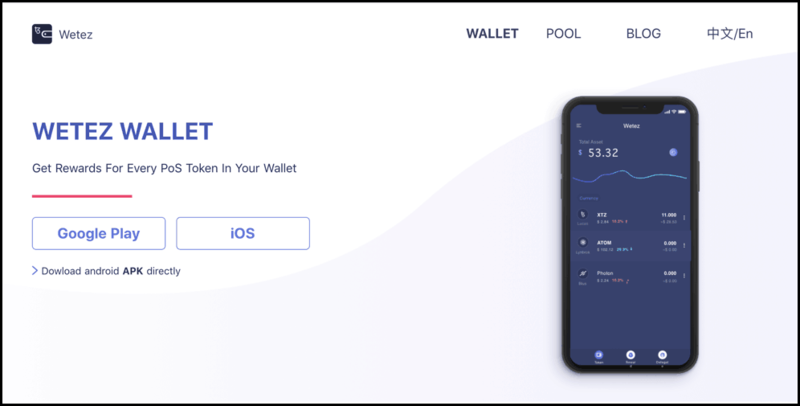 And for mobile wallet users, Gaurda wallet gives you the option to store Tezos in its iOS and Android wallet. Conclusion: So Which Is The Best Tezos Wallet To Download? Well, all these wallets I have listed here are relatively new in the market because it has been just one year that Tezos blockchain went live. So to assume that all these wallets will be free of any bugs will be a mistake but I would suggest you to use Ledger nano S combined with TezBox because they are one the oldest Tezos wallets available in the market. And apart from that, you can also try their official Tezos wallet (Tezzer) with Ledger Nano S and even the Cryptonomic’s Galleon Tezos wallet.